Part Two of a 3-part series written to answer the enduring question of transfer or direct when printing dye sublimation. Don’t miss Part One: Output and the Sellable Product and Part Three: Other Influencing Factors. Generally speaking, transfer dye-sub printing costs 5-10 cents more per square foot depending on the type and weight of the transfer paper used. But calculating the difference between transfer and direct is a little more complicated than it sounds. Pretreated fabrics for direct printing are 5-10% higher in cost than non-coated fabrics for transfer printing. That said, transfer paper costs about 11 cents per square foot on average, so while the fabric is slightly less expensive, the cost of transfer paper might make up for that. Depending on the application and labor involved, a transfer system could be more economical and leave more room for growth into other markets. If someone wants to offer several fabrics and finds themselves changing out the material 20 times a day, they would be a good candidate for a transfer system. By and large, when producing a range of different products, whether sublimating onto fabric or a ChromaLuxe metal panel, then it makes sense to go transfer because of the versatility. 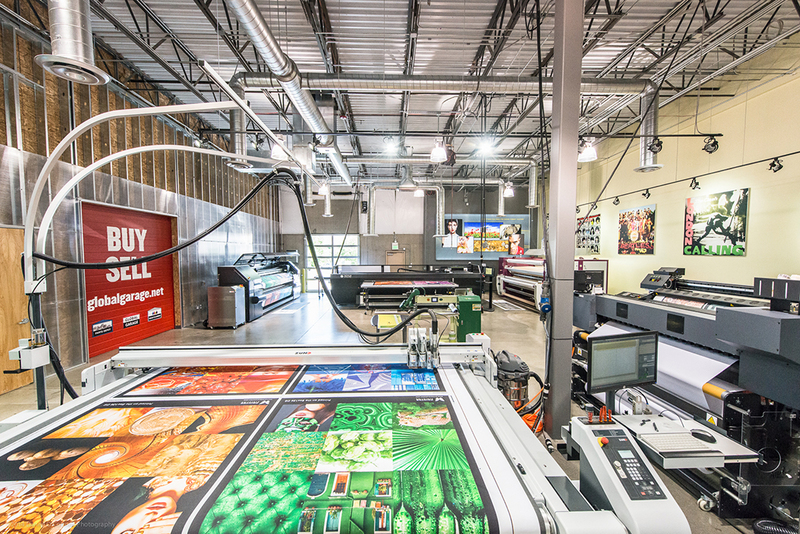 If a smaller shop just cares about running 3 or 4 fabrics for a specific set of applications, they would be a great candidate for a direct, all-in-one system because of its simplicity and efficiency. Two operators load fabric onto a Monti Antonio calender. While people like the versatility of transfer printing, the physical space required by a printer and a heat press is one of the biggest challenges with transfer printing. The two machines combined take up roughly 2.5x the space of an inline direct system. 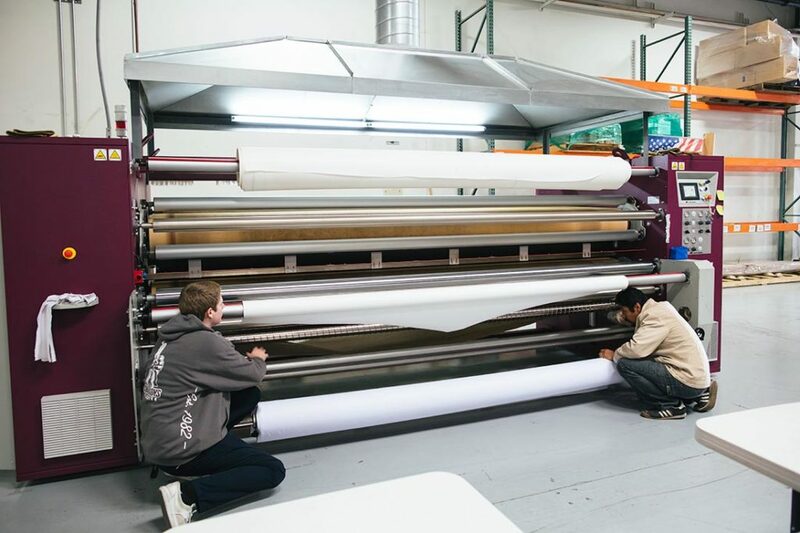 Then you have the complexity of marrying up ten-foot paper with ten-foot fabric in a lamination-type of process. You potentially need two people to assist in getting the fabric and the paper together on the calender, so you have more complexity on the backside of the transfer process. Pair that extra labor cost with the extra real estate and electrical to power the calender; this is often a less obvious but bigger determiner when considering the economics of the decision making process. We often recommend the D3200 and the Eos from PrinterEvolution which both do direct and transfer with an inline sublimation, giving you the ultimate in versatility and an efficient workflow. Two of the biggest applications, backlit and flags, can be printed direct and sublimated in a single step. These machines can also handle transfer paper for other applications which can be sublimated offline if needed. Having the versatility of a direct and transfer hybrid with the simplicity of an all-in-one system makes these machines truly unique.